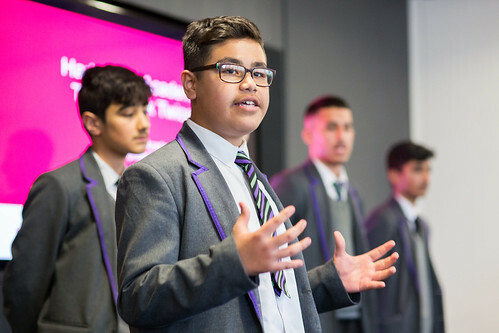 Students from Harborne Academy in Birmingham celebrate being crowned champions of the West Midlands as they go on to represent the region in The Prince’s Trust Enterprise Challenge National Finals 2019. They successfully fought off tough competition from the other top four finalist schools in the region; beating pupils from Bartley Green School, Eden Boys – Birmingham, Kings Heath Boys and St Peter’s Academy. The students pitched their business ideas, Dragons Den-style in front of highly acclaimed judging panel from a number of backgrounds that included: David Jones, Group Marketing Director – Premier Paper Group, Naheed Afzal, Co-Founder and CEO, Contracts IT Recruitment Consulting and Michael GW Henry, Managing Director – Dubtransmission Publishing. Keynote speakers on the day was BBC Midlands Today’s Joan Cummins and Prince’s Trust Enterprise young person, Founder of High Vibe, Sophie Rogers. “It has been such an inspiring day to be a part of. All the students did amazingly well and delivered their ideas with such great confidence and creativity. They should all be very proud of what they’ve achieved. Each year its amazing seeing the teams stand up their in front of a room of people they don’t know and deliver with incredible confidence. It takes a lot! There is a lot of energy in the room here today. (£500 of which as seed money towards launching their social enterprise idea). simulation game, with the highest-scoring team in each region creating their own social enterprise business ideas and pitching them in regional and national finals. The Enterprise Challenge National Finals takes place on Thursday 2 May at Hogan Lovells, London.